You can see it in him. Your child has all of the makings of a benevolent king. He has the will to protect his friends from bullies. He has some pretty impressive martial arts skills that he just HAS to practice in the living. Most importantly of all, he's itching to fight the bad guys—all he needs is a nifty super suit to get him started into the superhero game like Black Panther. Unfortunately, we're not quite as smart Shuri, so we can't get your child into an exact recreation of Black Panther's suit. We've tried to match her wits and we've tried to study up on the latest Wakandan tech, but all of that stuff goes right over our heads! That girl has developed powerful armor for T'Challa to wear during battle. She's even developed armor that absorbs kinetic energy and creates a nice glow throughout the armor. We can't wait to see what she cooks up next, but... we might not be able to recreate the whole "redirecting kinetic energy" feature of his costume, but we can certainly help your child get into a costume that glows! 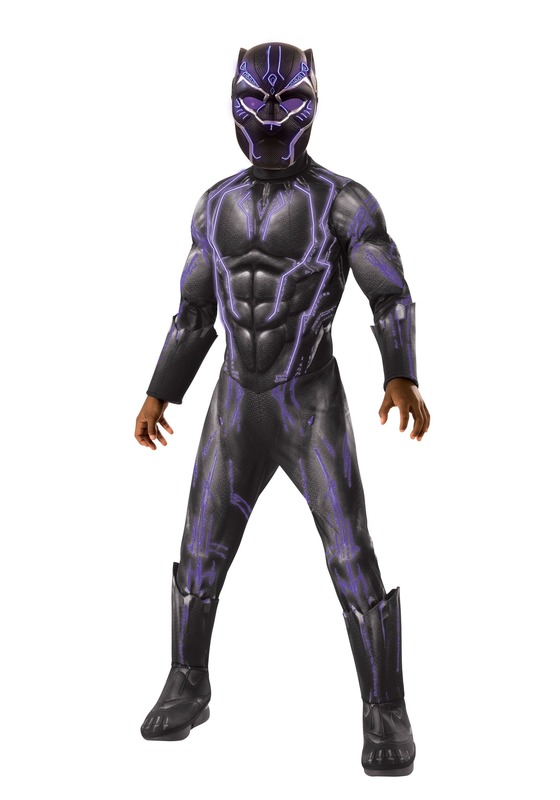 This child light-up Black Panther costume recreates the look of the costume worn by T'Challa in the Avengers movies. It comes with a black jumpsuit that has sculpted muscles in the chest and arms to help give your child a buff and tough look. The suit has plenty of purple accents along the arms and legs, and the costume actually glows to make your child look poised to attack! The legs have attached boot covers that fit over your child's shoes and the included mask adds the finishing touch to the outfit. If your child has an urge to fight for justice, then he's ready to assume the role of Marvel's Black Panther! Even Thanos won't be a challenge for your little one when he's all geared up in this officially licensed costume.